ALD is a leading global manufacturer of machines and systems for metallurgy and heat treatment. We also manufacture automation technology to handle highly complex processes inside machinery that would not be possible without automation. Our systems can also be synchronized with processes by adjacent systems and exchange process data with production control systems. ALD delivers systems customized to meet individual customer needs, including electronic components and software. We use standardized modules that can be expanded with custom solutions as necessary. Industry 4.0 / the IIoT provides all new process and operating concepts for our systems. More and more, machines are able to make their own decisions, monitor the behavior of machine components, and make recommendations to promptly replace wear parts (predictive maintenance). The operator can obtain information on the machine’s status, ongoing production and maintenance on a desktop, tablet, or smartphone via an app or web client. At the same time, the PLC communicates bi-directionally with the process control and ERP system. These are just a few of our many new developments – and we have plenty of ideas on deck for the future as well. We handle system controls, for instance, with PLC systems by Siemens (SIMATIC S7), Allen-Bradley, and other manufacturers. We use TIA Portal for programming in the SIMATIC ecosystem, and use operator interfaces based on WinCC and WinUX. We use fieldbus systems like Profinet and DeviceNet, and frequently employ OPC-UA as an industrial M2M communication protocol. We focus on forward-thinking issues like the use of artificial intelligence (AI, deep learning) in applications like predictive maintenance: the automatic recognition of component damage (such as ball bearings) based on changing measured sensor values incl. forecasts of remaining service life. At ALD, experts with many years of experience handle this broad spectrum of electrical engineering, programming, and automation technology challenges. Projects are characterized by close collaboration between different departments, including electrical engineers, computer scientists, mechanical engineers, physicists, metallurgists, and other engineering specialties. We work closely with universities, research institutions, and suppliers in development projects. 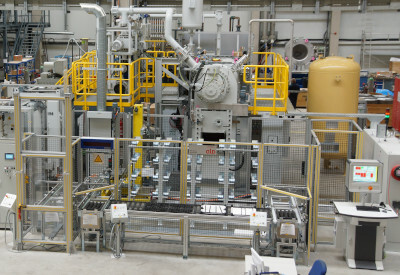 Customer projects, some of which pose unique challenges to automation technology, are handled through intensive cooperation with the customer’s project team. Seamless traceability for components, including all relevant manufacturing data, is more and more in demand. During the production process, traceability allows individual decisions to be made regarding the quality and selection of each individual component. A targeted search can also be carried out for critical components throughout their entire service life in case of recalls. A unique component ID in the form of a QR code is permanently laser etched into each component in an early stage of production. On a gearwheel for the manual transmission in a passenger car, for example, this includes data recording starting with machining, through heat treatment to further machining after treatment and all subsequent production steps incl. installation in the vehicle. Gearwheels are delivered in boxes for the heat treatment (tempering and annealing) process. 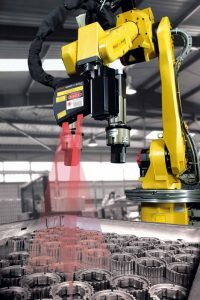 The exact position of each component must first be recorded using a laser scanner, then components must be picked up by a robot. Then the QR code / component ID is read by a scanner and the part is placed on a component tray. Its position on the tray may influence the component’s final hardness. Since this information is relevant to quality, it is archived in the component data set. Further process data such as process times, temperature and pressure gradient are recorded for each tray or batch. The robot also includes a sample of the batch, which is inspected before and after heat treatment. This makes it possible to detect the accumulation of carbon by the steel through the weight increase, and to estimate the generated surface hardness. OPC Unified Architecture (OPC UA) as the M2M communication protocol for data transfer between the equipment and the I4.0 platform PC. Specific programs in C++ for the I4.0 platform PC, including for data transfer with a server-supported SQL database. Device for displaying data: PC, tablet, smartphone, or data glasses. ALD heat treatment systems are used by automotive manufacturers and other companies for case-hardening of transmission components. A typical system might consist of equipment for pre-cleaning, case hardening, tempering and cooling, buffer spaces and conveyor systems to automatically transport the components on specialized workpiece carriers. The modular system concept allows the machines to be arranged in a custom configuration, and allows for different material flow strategies. The system controls are designed using modular hardware and software components. The system interacts with machines by third party manufacturers via interfaces. The overall system includes a comprehensive user interface (HMI), recipe management, logistics planning, batch tracking, process monitoring and data logging. The overall solution is based on Siemens S7 / TIA Portal, C# and a SQL database.